Join us for a special in-gallery talk featuring artist Adelita Husni-Bey in conversation with New York University professor Michelle Castañeda. Taking their cues from Husni-Bey’s first New York solo exhibition, “Chiron,” Professor Castañeda and the artist will discuss the intersection of performance, law, and immigration. 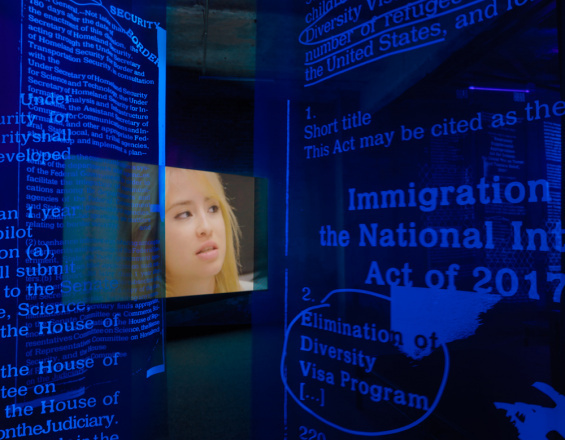 Castañeda specializes in investigating what and how the law performs in relationship to US immigration policy, while Husni-Bey’s new installation addresses historical and contemporary forms of rule, legislation, and the policing of bodies within society through experimental forms of pedagogy and performance. Together, Husni-Bey and Castañeda will explore how Husni-Bey’s work engages current conversations on immigration in the United States and the very real implications of trauma and exhaustion experienced by affected individuals, families, and those who work to guide them through the nation’s bureaucratic legal system. Full support for “Adelita Husni-Bey: Chiron” can be viewed here.